Sarah A. Sonsthagen, Robert E. Wilson, and Jared G. Underwood (2018) Interisland genetic structure of two endangered Hawaiian waterbirds: The Hawaiian Coot and Hawaiian Gallinule. The Condor: November 2018, Vol. 120, No. 4, pp. 863-873. Most of Hawaii's endemic avifauna are species of conservation concern. Some of Hawaii's endangered waterbirds, however, have increased in number as a result of intensive management of wetlands. To inform these conservation efforts, we examined interisland genetic structure and gene flow within 2 Hawaiian endemic waterbirds, the Hawaiian Coot (Fulica alai) and the Hawaiian subspecies of the Common Gallinule (Gallinula galeata sandvicensis), using microsatellite and mitochondrial loci. Hawaiian Coots and Hawaiian Gallinules occupy coastal wetlands and exhibit similar life history characteristics and generation times, although they may differ in dispersal propensity. Mark–resight data for Hawaiian Coot indicate interisland movements, whereas Hawaiian Gallinules are sedentary. Genetic diversity is partitioned across the landscape differently for Hawaiian Coots and Hawaiian Gallinules; patterns of variation are likely influenced by behavioral and ecological mechanisms. Hawaiian Coots exhibit low levels of structure at microsatellite loci (FST = 0.029) and high levels of gene flow among islands. Conversely, Hawaiian Gallinules are highly structured across marker types (microsatellite FST = 0.205, mtDNA control region FST = 0.370, mtDNA ND2 FST = 0.087), with restricted recent gene flow. Patterns of gene flow have changed after the population declines in the early to mid-1900s. Gene flow estimates indicate historical dispersal from Kauai to Oahu in both species, while recent estimates show individual Hawaiian Coots dispersing from Oahu and restricted gene flow between islands for the Hawaiian Gallinule. Changes in gene flow through time suggest that patterns of dispersal may be an artifact of the availability of habitat, which may be indirectly associated with the synergistic influences of population density and wetland quality. Despite recent population size increases for both species, continued threats to Hawaiian waterbirds (i.e. nonnative mammalian predators and invasive plants, avian disease, altered hydrology, and saltwater inundation of freshwater wetlands) will likely require continued active management to maintain viable populations. In 1856, Charles Lucien Bonaparte included two species in his new genus Canirallus, Canirallus oculeus ("Temminck" = Hartlaub 1855) and Canirallus kioloides (Pucheran 1845), without fixing one of them as the type. Subsequently, Witmer Stone designated kioloides (which he misspelled "kilioides", but this does not affect the validity of the designation) as the type in a work with a stated date of "June 12, 1894". R Bowdler Sharpe designated oculeus as the type in a book with a date just stated as "1894". When he described Mentocrex in 1933, James Lee Peters accepted Sharpe's type designation. But he did not cite Stone; nor did he indicate that he was aware of his type designation. Can Sharpe's work be "demonstrated to be in existence as a published work" (to use the words of Art. 21 of the Code) before Stone's ? If not, "June 12, 1894" being by default before "1894" in nomenclature, Canirallus might have to stay with kioloides. Can Sharpe's work be "demonstrated to be in existence as a published work" (to use the words of Art. 21 of the Code) before Stone's ? Vol. 22 had a preface and introduction dated November 1893. But was accessioned in the British Museum (Natural History) library on December 8, 1893. Vol. 23 has a preface and introduction dated February 1894. But it was accessed into the British Museum NH library June 9, 1894. Vol 22 had an addenda section at the end but Vol 23 has many more additions which may be why it took a few more months after preface than V. 22? In a universe where time moves in one direction June 9 1894 is prior to June 12 1894. Last edited by mb1848 : Sunday 10th March 2019 at 19:29. I see a date stamp ("8 DEC 1893") in your link to Vol 22, but I see nothing in Vol 23...? Yes you are right Laurent. I misinterpreted the numbers as 1894 6/9. No. But close. There is a review of Vol. XXIII from the July Auk of 1894 by Joel Asaph Allen. Vol 23 of the Catalogue of the birds in the british museum was reviewed in the July issue of The Ibis in 1894. Last edited by mb1848 : Tuesday 12th March 2019 at 00:27.
demonstrated to be in existence? In this attachment v. XXIII is not listed. So XXIII was published after February 15th. Not surprising since the preface is dated February 28th 1894. And the introduction by Sharpe was dated 2/27/94. Also on google books is Catalogue of the perciform fishes in the British Museum. by ...Boulenger, Attached at the back is “List of the current natural history publications of the trustees of the British museum”. Dated December 1, 1894. Not surprisingly v. XXIII is listed for sale. Not surprising since reviews were printed in the July numbers of the Ibis and Auk. Last page of https://books.google.com/books?id=aW...gbs_navlinks_s . At UCSD Scripps’s Inst. Library but originally from Brit Mus. NH. I am looking for a “List of the current natural history publications of the trustees of the British museum”. Dated May 1894 or June 1894. If anyone finds one please inform. Also if anyone could think of where else this book could be reviewed. I have check The Zoologist and Annals and Magazine of Natural History and found nothing. Volume 23 of the Catalogue of the birds in the collection of the british museum is listed as being recieved prior to June 30 1894 in an Annual Report of the Board of Regents of the Smithsonian Institution. Creeping closer to June 12, 1894. Last edited by mb1848 : Saturday 16th March 2019 at 19:16. Does Amaurornis (Poliolimnas) cinerea have an available substitute name (among its invalid synonyms: brevipes, ocularis, micronesiae, minima, leucophrys, meeki and tannensis) ? Subspecies ocularlis was replaced by Mathews because he believed it to be preoccupied. 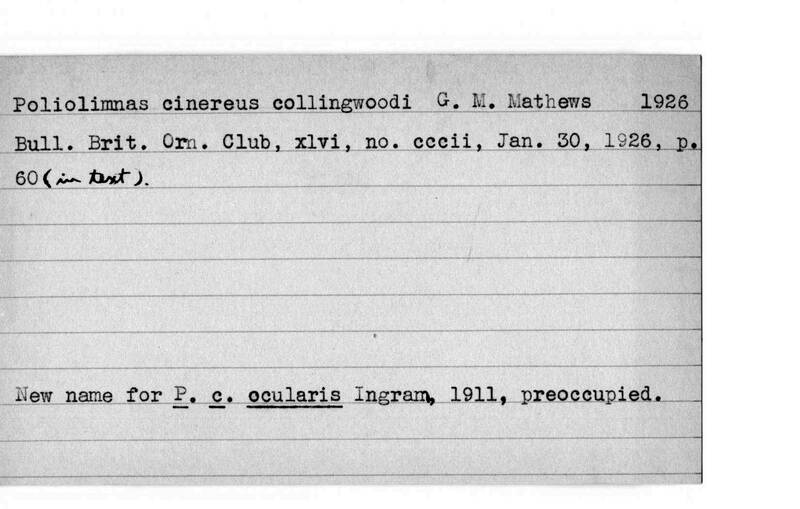 Using collinwoodi as Ingram's first name was collingwood. 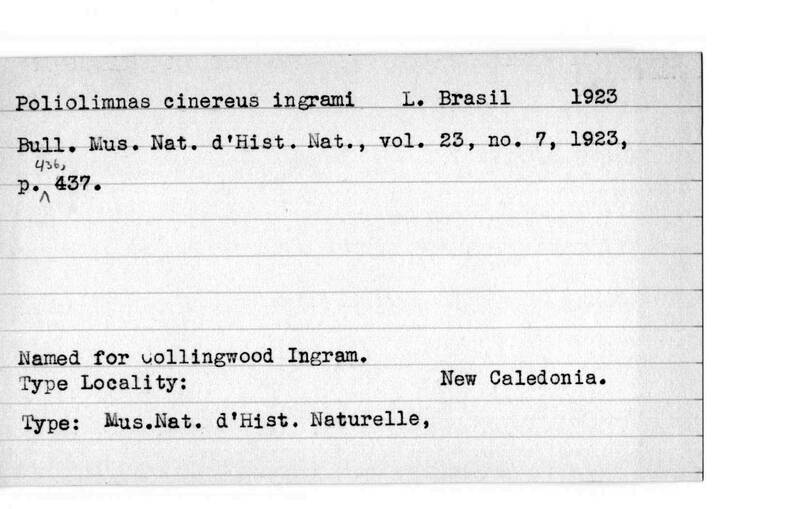 But someone else had named it ingrami in 1923? Ingram thought P. c. tannensis should be used??? A couple of older names. Last edited by mb1848 : Wednesday 20th March 2019 at 01:42. I ask that because apparently, Gallicrex cinerea (Gmelin, 1789) is embedded within Amaurornis (cf. Boast & al., 2019). I don't know the phylogenetic position of Amaurornis (Poliolimnas) cinerea (Vieillot, 1819) but if this species is a true member of Amaurornis, we are faced with a case of homonymy. This leads to the following question: What is the true year of Amaurornis, 1852 or 1853 knowing that Gallicrex was erected in 1852 by Blyth ? Last edited by LeNomenclatoriste : Wednesday 20th March 2019 at 08:07. What is the true year of Amaurornis, 1852 or 1853? Good question. The HBW Alive Key to Scientific Names in Ornithology gives the year of publication of Amaurornis as 1852 while H&M4 gives it as 1853. Accord. to Slikas (2002) Amaurornis (Poliolimnas) cinerea is close to Aenigmatolimnas marginalis, but are old works reliable? I have written above a while ago (post #65) that the Amaurornis akool mt-genome was wrong, because large parts of it are near/fully identical to Gallinula chloropus. Additionally, the remaining parts of this mt-genome (that do not look like Gallinula) do not, actually, look like other available sequences of A. akool either. They look like sequences of A. phoenicurus. (Three cox1 and two cytb from GenBank (from [Yang et al 2010] and [Ruan et al 2012]) and, as you note, the analysis of cytb data by [Slikas, Olson & Fleischer 2002], all indicate congruently that akool belongs in Zapornia, not in Amaurornis, where it ended up in Boast et al's analysis.) This mt-genome is clearly chimeric, resulting from a mixture of the mtDNA of (at least) two taxa, neither of which appears to have been genuine Zapornia akool. Unfortunately, this mitochondrial genome was included in Boast et al's data set. Chimeric sequences, in cases where the two involved taxa are also included in the analysis as well (as here), are attracted simultaneously towards two different parts of the tree; additionally, through them, these two portions of the tree become unduly attracted towards each other: the presence of a chimeric sequence in a data set will affect the tree in ways that go far beyond a simple wrong position of the taxon the chimera are supposed to represent. If one of the taxa is dominant in the mixture, the chimera may remain associated to the group this taxon belongs to. But the attraction towards the other involved taxon (which lies outside the group) will then often result in it assuming an unduly basal position in this group. If the topology within this group remains nevertheless 'correct', the whole group will then end up completely mis-oriented. A usual 'symptom' of a mis-oriented group is that the branches in the group become shorter and shorter as they become more basal -- this is exactly what you see in Boast et al's Fig. 3: the branch to the chimeric "Zapornia akool" is shorter (i.e., the tip ends up positioned more to the left) than that to Amaurornis phoenicurus, which in turn is shorter than that to Amaurornis moluccana/olivacea, which in turn is shorter than that to Gallicrex. Don't misunderstand me -- successively shorter branches are no proof that a tree is wrong; heterotachy can happen. But, when you see this type of pattern in a clade where the basal-most sequence, at the end of the shortest branch, is demonstrably chimeric, you should definitely not bet a single coin on the apparent relationships within this clade. Without the chimeric "akool" sequence, it is quite likely that the group would readily re-orient with Gallicrex sister to the three (other) Amaurornis. I see nothing suggesting problems in Slikas et al' paper, although they never released their sequences (deposition in GenBank was not yet a standard procedure back then), thus it is impossible to check how they would behave in an analysis that would also include more recent data. The topology they found seems in any case compatible with what more recent analyses have indicated. Dating Reichenbach's parts are/is tricky. On page 680 of A Catalogue of the Collection of Birds Formed by the Late Hugh Edwin Strickland it says 1851. The Zoonomen citation for this subgenus is Handb.spec.Orn. lfr.3DieVogel p.XXI ? rel Av.Syst.Nat. p.xxi. Page XXI has Amaurornis . https://www.biodiversitylibrary.org/...ge/77/mode/1up . The forward is dated 1 October 1852. Last edited by mb1848 : Wednesday 20th March 2019 at 17:55. I am looking for the original description of A. olivacea the type of Amaurornis. I have seen it as page 109 or 135 or 220? And plate 20 or 30. Of this. https://www.biodiversitylibrary.org/...ge/14/mode/1up . But it is not the right supplement. On page 83 of Hawaiian National Bibliography 1780-1900: 1831-1850 is a detailed description of this publication. I am looking for the original description of A. olivacea the type of Amaurornis. Last edited by l_raty : Wednesday 20th March 2019 at 18:10. Even supposing that Amaurornis was published in 1852, I guess it's hard to say which one (it and Gallicrex) was first? Priority! recommends using 1853 for Amaurornis. Last edited by l_raty : Wednesday 20th March 2019 at 18:54. E. C. Dickinson says that Gallicrex and all names dated 1849 (1852) in Peters should be changed to 1852. Leiferung 7 Tauben https://www.biodiversitylibrary.org/...ge/91/mode/1up . I think the name is 1852 but would like to see more research. This portion of Reichenbach's complicated work is generally quoted as of 1852, probably because it contains a "Vorwort" dated "1. October, 1852," but it seems not to have been published until 1853. It appeared in the third Lieferung of the "Handbuch der speciellen Ornithologie," and consists of pages I-XXXI, with signature marks bearing the words "Systema Avium." Hartlaub, in his record of ornithology for 1853 (Archiv fiir Naturgcsch. ), 1854, vol. 2, p. 33), includes it among the publications of that year. Lieferung II is from 1852. According to Cabanis lieferung IV und V of Reichenbach's Handbuch der speciellen Ornithologie are dated August and November 1853. Thank you to Laurent for finding the OD of G. olivacea but it is embarrasing that he posted six minutes after I asked the question. I really was trying hard to find it. Last edited by mb1848 : Thursday 21st March 2019 at 17:34.